Brooklyn indie band Grizzly Bear are gonna be in Miami Beach next Tuesday, June 18th for a show at The Fillmore. Our friends at The Fillmore have asked us if we'd like to do a giveaway for the show, so of course we had to say yes! I know Mike has been a big fan of theirs who has covered them for years. 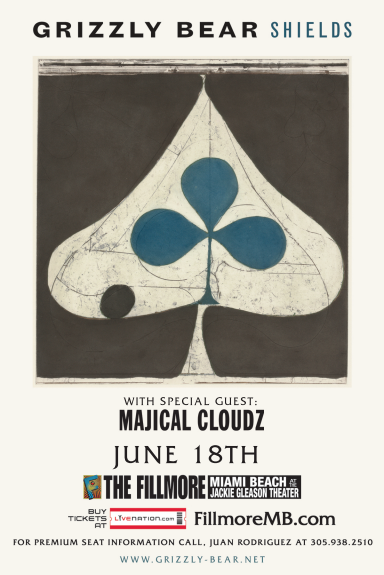 Grizzly Bear is supporting their 2012 album Shields and will be supported by Majical Cloudz. Grizzly Bear near me in less than TWO WEEKS!!! Yes please!!!!! This would be stellar! hope i'm a winner! congrats to sevim for winning two tixs for the grizzly bear show! thanks to everyone who participated and keep trying as there are more in the works and we never repeat winners. cheers!